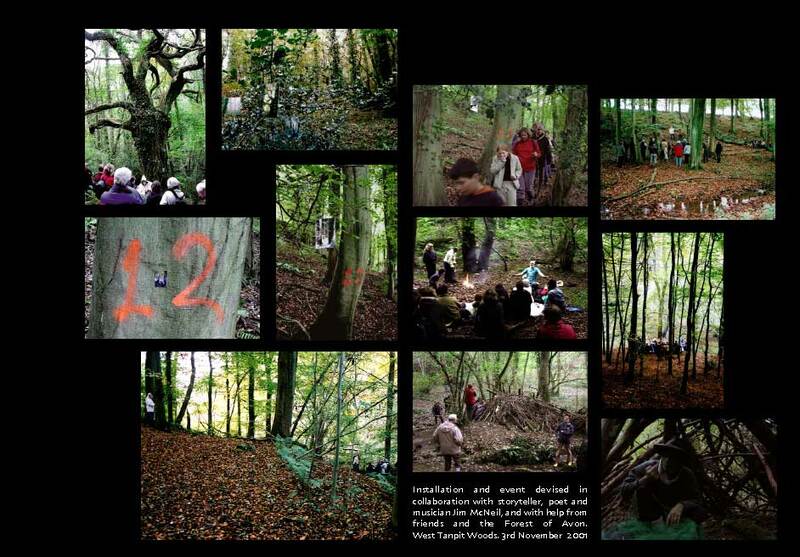 The project became a residency with the Forest of Avon, and culminated (or had its first culmination!) in an exhibition/installation/event that was part of the Year of the Artist initiative in 2001. This very small forest was a place I’d already spent 12 years or so visiting with the family and friends and it was the combination of my familiarity with the location set against the constant change in appearance – and atmosphere – inside the woods that I wanted to explore over the year. It was a major undertaking, and one that I wouldn’t have carried through if it hadn’t been for the support of my fellow members of the Ship of Fools artists’ group. But the outcome was enormously rewarding, expanding into other projects and opening up a number of creative and work opportunities. This year of documentation was just before I took up using a digital camera so all the shots were taken on an SLR with a tripod, using 35 mm colour negative film. At the time of taking them I had no idea what I would do with the photographs and felt fairly directionless once the year was over. But this was where Ship of Fools proved such valuable critical/creative friends and after some months of conversations and picture editing the idea for the exhibition emerged with the final selection of images scanned to create the large digital prints. In addition to these photographs of the changing year in the woods I also wanted to discover how the woods had been used during their history, and to show how my children and their friends had spent some good ‘growing-up’ times there since they were little. So I included panels of photographs that explored its past use (as a tannery, pheasant shoot, trout hatchery, a source of water for local farms and as a film location for the 1980s Robin of Sherwood TV series) as well as depicting our own visits there for picnics, birthday parties and regular walks. There were other elements in the show too such as the journal I kept over the year of photographing in the woods, and a moving-image sequence of a year of vegetational change on small screens (a novelty then), loaned by HP Labs with whom Ship of Fools had been doing some exploratory work (this exhibition led to further collaborations with the HP team, see below). Through the design of the show I aimed to recreate the sense of taking a path among trees so each of the photographic panels was suspended from the rafters and swayed slightly as people walked past. My design was wonderfully translated into reality by partner Peter Milner with support from other family members and friends and Jim O’Shaughnessy and Nigel Howe from the Forest of Avon. I’d also used video to document my year in the woods, not much of it was good enough to use (I enjoy the activity of filming but stills photography is more my medium! 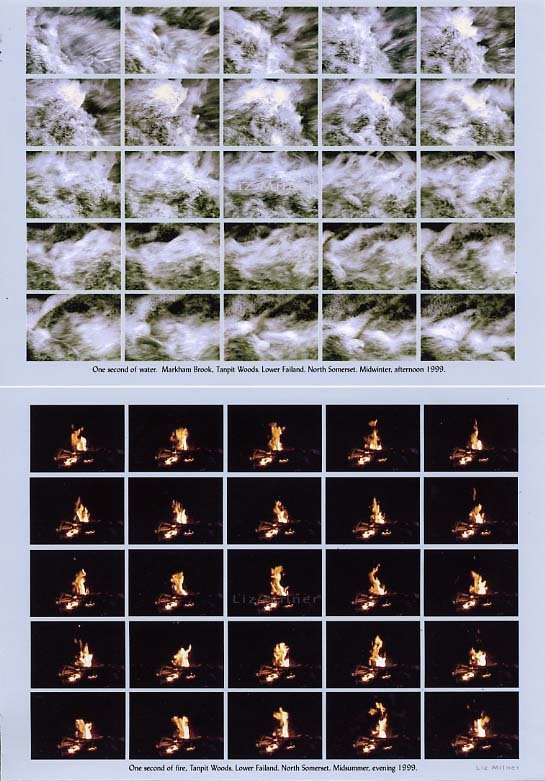 ); however I did grab some 1 second sequences as still frames (25 frames provides one second of video) that I’d taken at midsummer and midwinter of – contrarily – fire in June and water in December and these were also displayed. The (ropey quality, pre-digital video tape) film below was my attempt to record the sensation of a visit to the exhibition. 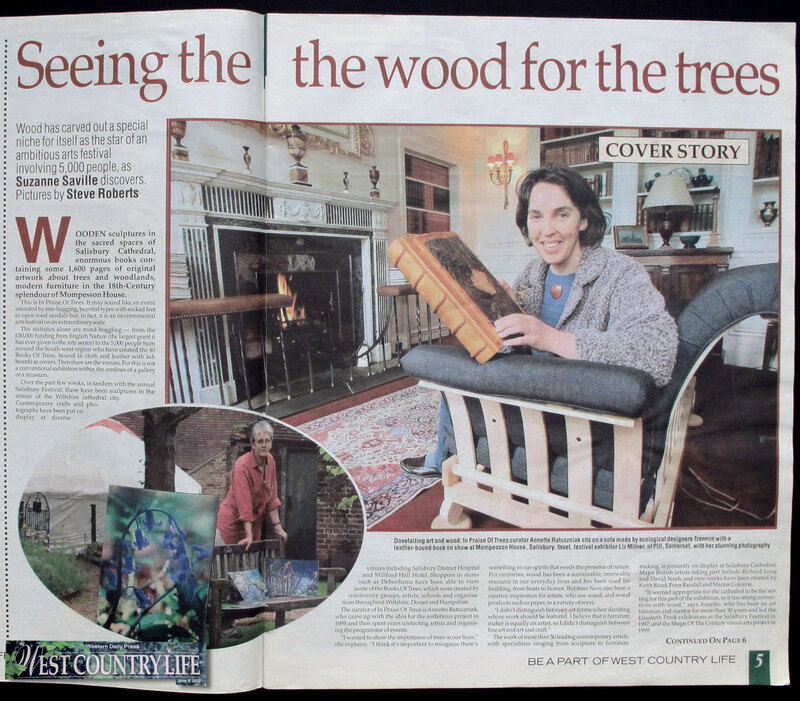 It had always been part of my vision that visitors to the exhibition (there were almost 800 over two weeks) should have a chance to experience the woods first-hand too, so during the run of the show I devised a day’s event in conjunction with the Forest of Avon and a storyteller/musician. I took him to visit the woods and explained what I’d learned about it, which parts I found particularly special and what I hoped he’d be able to do with the visitors. The exhibition and event had been planned for May – the most luxuriant time to visit these woods, but it was the year of the devastating Foot and Mouth epidemic so not only were we unable to hold the exhibition at Ashton Court, I was also prevented from visiting the woods for months; after almost living in it for a year it was a very hard situation to come to terms with alongside the appalling sights of distraught farmers and animal pyres on our TV screens. However, by October we were allowed back to the woods and into Ashton Court and the day of the event in early November was kind and mild. I’d planned a route around the wood which would take visitors to some ‘ woodland galleries’ where I’d placed some of my photographs of varying sizes in the locations they’d been taken, but at different times of the year so on this mild autumn day we could see the view we were looking at as it had been in the winter snow or with the dense wild garlic flowers of spring. Our thirty or so participants (ranging in age from 7 to over 70) arrived by mini-bus from the exhibition and were greeted by the storyteller who was sitting under one of an entwined pair of huge ancient oaks (now sadly fallen) holding a tiny book of photographs from the exhibition. He told stories, led people on along the route I’d mapped out, made up a poem about me and the woods, and sung songs, both funny and haunting. Finally, after a last tale by the fire, he said farewell and sent the visitors to a den on the little hilly island in the middle of the stream where they met a grumpy ‘woodland elf’. 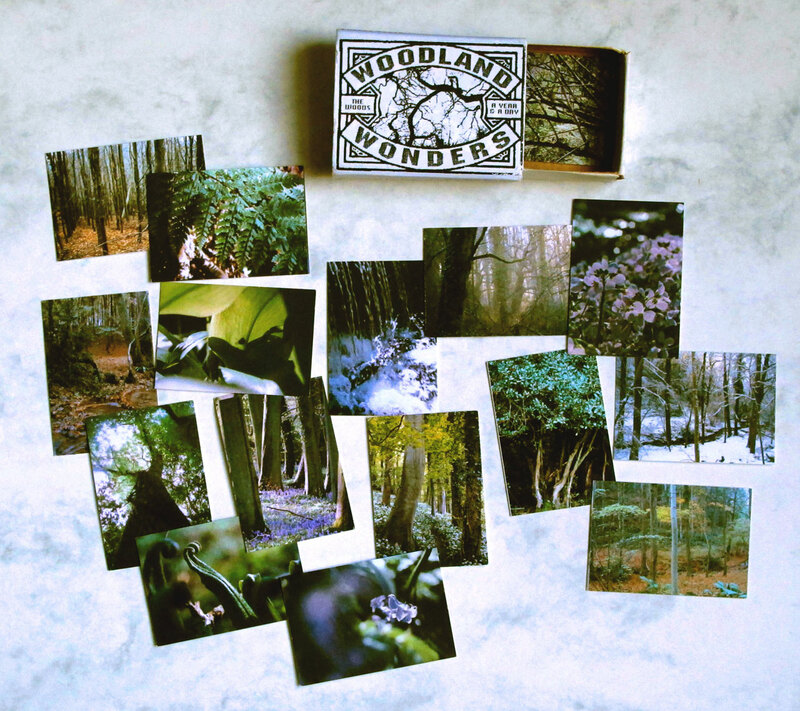 Despite his mood the elf grudgingly gave each visitor a gift – a tiny box of ‘Woodland Wonders’ to take home with them – the matchbox had a specially designed label (by Peter Milner) and contained a miniature set of the photographs from the exhibition. I occasionally meet people, a dozen years on, who came to that event and tell me how magical it was, and that they still have, and treasure, their box of Woodland Wonders. The following video of the day’s event in the woods was made for me by Jon Dovey, one of the Ship of Fools members. 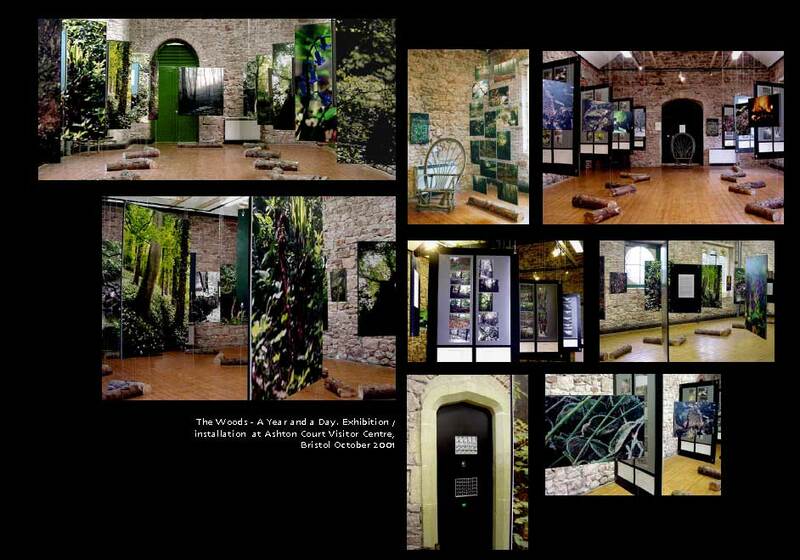 Parts of the exhibition went on to have other lives – a year later, many of the images were displayed again at Ashton Court as part of the Forest of Avon’s Good Wood Exhibition (see the post on The Woods – transformation); some of the photographs were incorporated into a poster I designed for Swedish ‘education outdoors’ organisation; several of the larger images were displayed in a yurt as part of the ‘In Praise of Trees‘ theme at the Salisbury Festival in 2002; photographs of the ancient twin oaks were included in a show at the Winchester Gallery; twenty four of the larger photographs became the subject of research project with HP Labs (see The Wired Woods post), that led to a portable version going to a wearable computing conference in Seattle, which itself became a topic for further exploration and analysis (see Dislocating the Woods)…the Woods continue to evolve. This entry was posted in Artist's books, Design, Exhibited work, Landscape and seasons, Personal Arts Projects, Place, The Woods and tagged Ashton Court, familiarity, Foot & Mouth, Forest of Avon, midsummer, midwinter, miniature images, narrative, poems, scale, seasons, songs, storytelling, trees, water, woods. Bookmark the permalink.